“The Gexoterra” is a draft of a short story from a collection I am writing on the cruelties and physical tragedies perpetrated and faced by people throughout history. 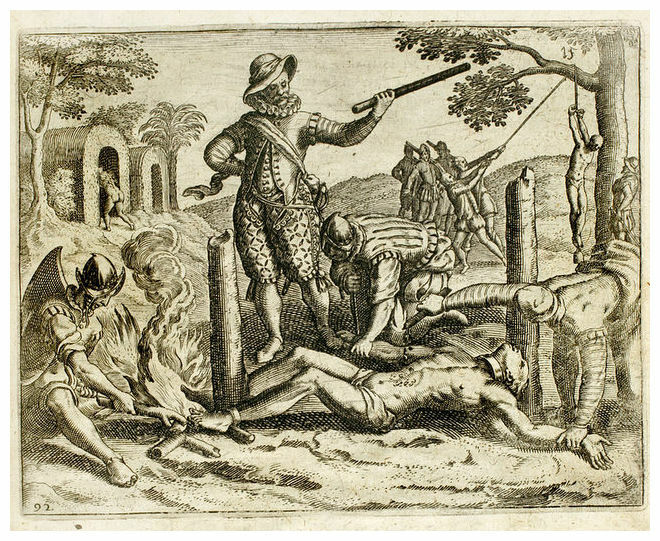 “The Gexoterra” is about the life under the Spanish in the “West Indies” after they were “discovered” by Columbus (Cristobal Colon) and his men, and as such it depicts some harsh, unpleasant moments. If this bothers you then don’t bother reading but, remember, I try to depict what happened as realistically as possible, and the event depicted here is based on evidence from Columbus/Colon’s own journals. Make of that what you will. There is little, if anything, the Colombian expedition could have done to mitigate the blight Eurasian microbes brought upon the indigenous peoples of the Caribbean Islands off the coast of the Northern segment of the equator sprawling North & South American landmass (Canal Zone notwithstanding). Though, one suspects that if Colon (and he was Cristobal Colon, not this Columbus tomfoolery) had any conception of what he was bringing with him on his journey, he would have tried to find a way to make it an even more deadly weapon then it already was. As it was he did not know which part of the planet he was on. These people were animals to him, a natural resource, like gold or silver or spices, another check he could put in his ledger. The males could be worked to the bone clearing the land and mining for the precious ore that would make this horrid trip worth the while, the women could be used as concubines and as washerwomen, cooks, and agricultural labor. Even the children would serve a purpose; they could be used to clear rubble and debris and could fit into the places in the mines, the female ones could be used as concubines if they had seen their first blood, and the stupid ones could be used to feed and entertain the dogs. A few had to be kept alive so they could be taken back to Spain, to show off to the investors and to prove that he had in fact reached the orient (or wherever this was). The poor beasts were so frail, though, and not at all used to the rigours of proper labor. They broke like Cathay porcelain, and they were so very sickly (again, if only he had known what caused this frailty…) that each worker usually only lasted a week, two at most, before he expired in a sweaty, bloody heap. The dogs were starting to grow fat off of this excess of heathen flesh. The Basques were having a gay old time of it, running about the beach, prancing about in the surf like silly little children. There was nothing for them to do that the Indios (that is what they were calling these people…it certainly wasn’t Japan, where they had landed so India would have to do. They did have a similar skin hue…) could not do for them. Every man was now a lord, or else what passed for one in this new world. The poorest of the men, some son of a dog from Getxo, even he had slaves now, three of them, two women and a man. The man was put to work doing the most menial and stupid of tasks, emptying the latrine, fetching water, cleaning his master’s boots. The Getxoterra had a short, leather strap that used on the dogs when they misbehaved, and it was with this that he administered his orders to the Indio wretch. As the savage could not understand Basque or whatever it is they speak, he would point at what he wanted the Indio to do, and then punctuate the order with a blow to the head with the strap. the poor savage looked as though he could not believe he was being so ruled and by such a lowly sort of fellow. The Getxoterra paled in comparison to the men he now treated like a dog. Where the Indio was lithe and trim the Getxoterra was flabby and round, where the former was beautiful and young, the latter was old and ugly as a Frenchman’s sin. That the Getxoterra ruled over the Indio and not the other way around was merely an accident of history and circumstance. There is no justice in nature, because there is no intellect, no mind. There is only a living mass acting and being acted upon. If there were any justice, it would be the Getxoterra of the world who would be slaves…but then again would that not just serve to make the Indio the Getxoterra? The Getxoterra was not endowed with a mind that was able to contemplate such lofty questions. All he knew was that now had property for the first time in his life. And like most people, when they are given exactly what they always wanted, they misuse and squander it all. It took only a few days of labor under the lash of the Gextoterra before the Indio expired from exhaustion. The dullard Getxoterra had neglected to feed and provide water to the Indio. He was left with the two female slaves, one old, perhaps 50, the other young and quite beautiful. It did not take a debauched mind like the Gextoterra possessed long to find a use for the young woman, but the elder was really more of an annoyance to the Getxoterra, with her constant weeping and screaming. The young one tried to calm her elder but the Getxoterra would not leave the poor young woman alone long enough for her to be really effective. He defiled her and abused her brutally, satisfying the the stunted and profane desires of a brute, and it was not a week before the young woman lashed rocks to her ankles and swam out into the surf. The Getxoterra was now left with the old woman and having no use for her and growing tired of her weeping, he cut out her tongue and tied her to a stake out side of his tent, leaving her to starve. Blessedly this did not come about. Another Indio soon came by and brazenly, in full view of the entire encampment, caressed and kissed the old woman before slashing her throat with a sharp shell. The Getxoterra did not mind, as he had already moved on to a new pursuit: taking a flaming brand in hand he terrorized and deprived Indios of their trinkets and idols, thinking that they were somehow transformed by witchcraft from gold to dull stone and could be turned back the other way again. The Getxoterra had been a tanner’s apprentice back in the motherland, and a slovenly, slothful, and stupid one at that. He had spent all of his weekly stipend on booze and cheap women and so had to sleep on the floor of his master’s shop. He had what he would have known as the French Disease but what we would call syphilis. He was a wretch of the worst sort. Now he was master over the fates of hundreds of people who had only been going on about their lives before the three ships appeared on the horizon of their world.